Packed with puzzles, cool quizzes and great games, dedicated followers can enjoy testing their knowledge of the band to find out if they are true super-fans. Activities include fab fill-in stories, wordsearches, spot-the-difference games and much more! 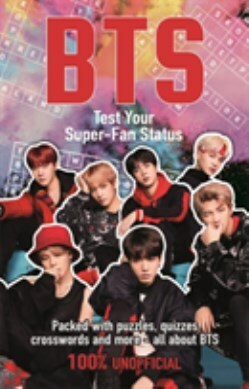 BTS: Test Your Super-Fan Status is a fantastic and fun-filled quiz book on all things BTS, the breakthrough K-pop band with a global army of fans.